Taipei, Taiwan -- A handsome but controversial young Tibetan lama has emerged on Taiwan's music scene by releasing his first CD -- a collection of rap and hip-hop songs which he claims can help promote Buddhism. 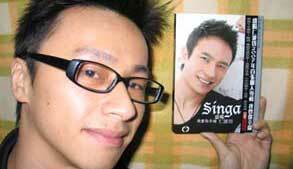 Singa Rinpoche, 30, who is barred from entering Taiwan due to his flamboyant behavior on a visit to the island last year, released the CD -- Wish You Well -- on February 10 through Taiwan's Forward Music company. Since then, several Taiwan TV channels have been airing the MTV spots promoting Singa's album -- showing Singa recording songs in the studio, running in a forest and releasing a bird into freedom. Wearing his trademark white shirt and blue pants, Singa, 179 centimeters tall and weighing 63 kilograms, shows a natural talent for performing by flashing smiles and making poses, showing off his youth and confidence. Singa signed a contract with Forward Music in April 2006 and began recording at a Beijing studio in July 2006. "We were surprised by the public response to this CD. It is selling extremely well. We have opened a blog for Singa Rinpoche and within a week, 100,000 people have browsed it," Forward Music press officer Cheng Chao-jen told Deutsche Presse-agentur dpa. Most of the 12 songs on the CD were written and composed by a Taiwan musician and two were written and composed by Singa. They are: Reincarnation, Wish You Well, Let Me Take Care of You, Fashion, It's the Light, Girl Quji Zhuoma, Starting to Realize, Leave Love to You, Today, Lama Chino. In the songs, Singa mixes rap and hip-hop with chants of Buddhist sutras, and switches from Chinese to Tibetan and English. The songs deal mostly with love, but he also preaches his philosophy. The song Leave Love to You has this rap line: "All the pain in this world is caused by seeking happiness for himself/All the joy in this world is caused by seeking happiness for others." Born in Qinghai Province, China, in 1970, Singa claims a rainbow appeared in the sky when he was born. At 16, a Tibetan monastery confirmed he was the reincarnation of a high lama. Singa claimed he spent three years studying Buddhism in Nepal, Tibet and Thailand, before travelling around the world to spread Buddhism. But when he visited Taiwan from February to April 2006 to promote his book, This is me, a living Buddha, he caused controversy because he acted more like a film star than a monk. He wore trendy clothes and received his disciples wearing a shirt and jeans, not the red cloak worn by Tibetan lamas. Some Taiwan disciples alleged Singa had not finished Buddhist studies in India and had not been ordained, prompting the Interior Ministry to bar him from entering Taiwan for one year. Cheng Chen-huang, a professor of Buddhism at the Fokuangshan University, believes Singa Rinpoche has violated Buddhist precepts, or moral codes. "There are 250 precepts for a Chinese Buddhist and 253 precepts for a Tibetan Buddhist. For a Buddhist, these codes are very important and must be observed," Cheng told dpa. Agga Wandha, a 59-year-old Burmese monk in Taipei, agreed. "The essence of Buddhism is to quench desires in order to achieve inner peace. Singa Rinpoche's wearing fashionable clothes and driving fancy cars shows he is feeding these desires. He is really in a mess," he said. But Singa Rinpoche's behavior is nothing new to Tibetan Buddhism. Three hundred years ago, the sixth Dalai Lama raised eyebrows because he frequented Lhasa's red light district at night and wrote love poems. A more recent example is Dzongsar Khyentse Rinpoche from the Himalayan Buddhist kingdom of Bhutan, who directed two films -- The Cup in 1999 and Travelers & Magicians in 2005. Dzongsar Khyentse received world acclaim for his films and continues to travel around the world to preach Buddhism. No one had criticized him for making films.